Her dancer's resumé includes work with stars of contemporary choreography--Twyla Tharp, Trisha Brown, John Jasperse, to name a few. She has won two Bessies and launched her own well-regarded dancemaking career. 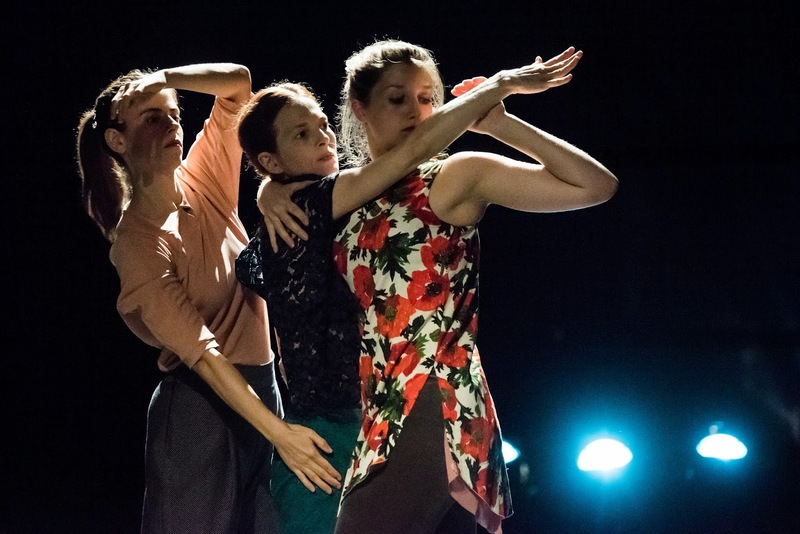 This week, Jodi Melnick made her BAM debut as a choreographer with Moment Marigold, created for BAM's 2014 Next Wave Festival. 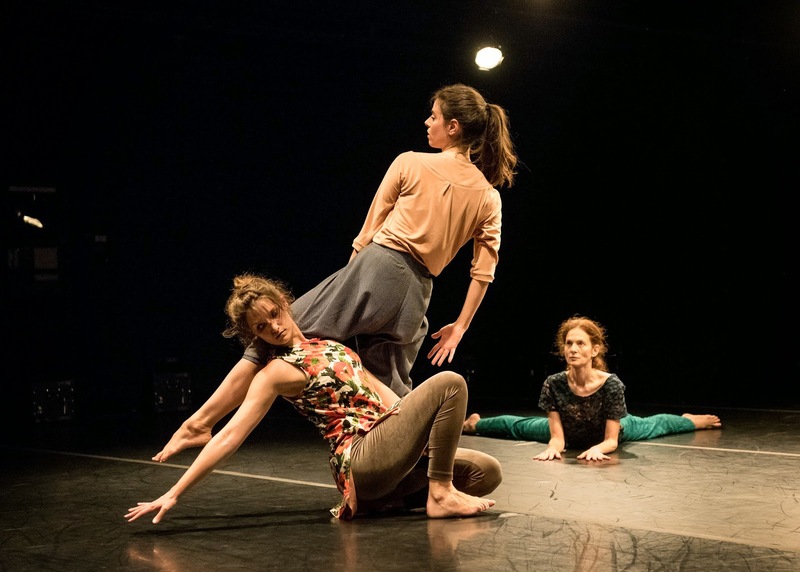 Moment Marigold announces itself as a special kind of trio when, after simply walking out into BAM's humble Fishman Space, three women--Melnick with EmmaGrace Skove-Epes and Maggie Thom--variously attach themselves to one another. Hands touch, heads touch. Three graces intertwine in silence, clothing themselves in each other's physicality. The dance progresses, for slightly less than an hour, as an unspooling of movement that really does look like what Melnick has called it--"a living thing" and "a continuous act of creating." An early passage in Steven Reker's new composition for this piece reminds me of a journey by train, a regular rhythm of chugging and chiming, marking time spent that can be either tedious or pleasurable. How you hook into Moment Marigold might say something about your own fascination with small discoveries, your patience in observation and your own identification with these three explorers on their journey together. Do you feel their sticky-looking hands and sense your own? Their heavy arms? Their controlled stumbles? Their rubbery capabilities? Their bodies' twisting, rippling impulses opening out into the surrounding air? When Skove-Epes wing-like arms cup a buffer of space around Melnick's arms, can you see and hear what energy is doing in that gap between flesh? In this context, some marigold moments work well because they are understated. Others, conversely, shout to pointless effect, feel out of place, break the spell by trying too hard. I'm thinking, specifically, of those arms extending out in a circle with splayed, vibrating hands. Melnick brings this out twice, and each time, the impulse looks forced and phony. Melnick is a delicate bird--one with determination and durability. Skove-Epes and Thom, as powerful and gorgeous as raptors, translate Melnick's fluidity more directly and firmly and provide a necessary grounding force for this dance. At one point, each of the dancers stride right up to the margin in front of the first row of audience seats on two sides of the space. It's their first acknowledgement--if it is, truly, an acknowledgement--of an outside world and outsiders. They become monumental, properly humbling to gaze upon. One should feel a little awe in the presence of a dancer. If you manage to get a ticket, go early and claim a front-row seat. Moment Marigold's final performance is tomorrow evening at 7:30pm. Tickets are sold out, but check here for ticket standby information--and good luck!